El Milagro Marina owner Eric Schott caught this as headed into the lagoon ahead of the expected hurricane. There's a log beside me on the platform as an anti-capsize measure because despite the apparent calm there is a strong wind blowing, enough to make me wear the life jacket for the first time. This photo is distorted - stretched sideways - the boat is not that long nor I that wide. Lord, she looks beautiful! And you made the wonderfully setting sail yourself! How fast were you going? Of course, the boat looks fast just sitting still. After all you’ve been through it’s amazing he looks that good and you as well. 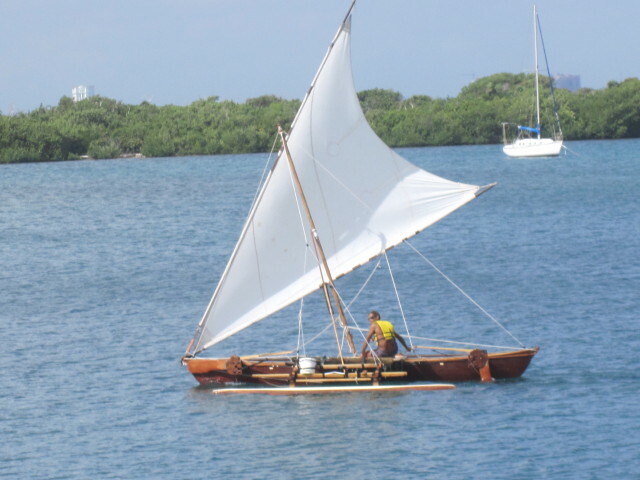 I sailed across part of Lake Superior in a home made sailboat in 1966 and thought that was an adventure. Nothing compared to what you have done. How wonderful!